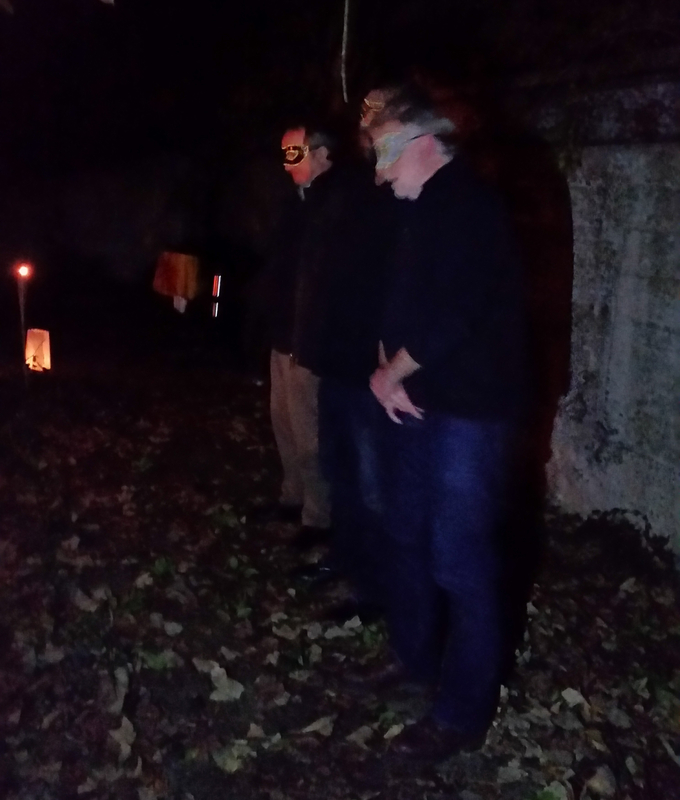 Art Plumstead’s Halloween Event returned to Workhouse Wood this year in a slightly different format, with people invited to share their own ghostly stories to supplement the planned programme of entertainment. The motley crew began assembling on Winn’s Common shortly before 8 pm at the top of the steps leading down into the woods, with a hi-viz jacket or two helping nervous first-timers find the meeting place. In all, 18 people (plus one dog and who knows how many restless spirits) came along. Making a last sweeping pass of torches across the expanse of grass for any latecomers, Kevin led the party down into the bosky gloom and the divertissement began. After a brief foray into the woods the first performance site was reached. The story was an edited version of Abraham’s Boys by Joe Hill (read the full text here). As it divides naturally into three parts, the further two sections were read out as the group traveled further and further into the murky woods. Mysterious ornaments, made from bunches of herbs hung from the trees. Ever and again the more discerning noticed the faint smell of lavender. There was even a mysterious shrine to add to the eerie atmosphere, featuring Moriarty the cat who appeared in Art Plumstead’s Halloween two years ago and apples cut crosswise to reveal the star shape so beloved of witches. The final part of the tale was read out at the site of the old pig sty, before John told a true tale of Mary Wickens , the Blue Guardian, who was in charge of the welfare of children at the Woolwich Union Workhouse at 79b Tewson Road Plumstead. Set in the 1870s it is the tragic story of the death of two small sisters and Mary’s ghost that roamed the hospital afterwards trying to right the wrong she had done. Then Margaret described the spooky goings on at The Cage in St. Osyth, Essex which have forced the owner to put the property on the market – no takers so far. Finally, after Erik’s recital of the 1899 poem Antigonish by William Hughes Mearnes, there was a lighthearted improvised question and answer session about the supernatural hosted by a three-headed monster performed by John, Mark and Erik. No ghosts materialised, and crucially nor did the promised heavy rain. When all the tales were over, mulled wine was served before the crowd dispersed, some going to The Old Mill for an extra drink to calm their nerves, and the rest fleeing for the safety of their own homes, vampires permitting. This entry was posted in Outreach, Performance, Photographic and other Walks and tagged Abraham's Boys, Halloween, Joe Hill, story, The Old Mill, Winn's Common, Workhouse Wood on 1 November, 2018 by placerias.